The new site for the restaurant and B&B “La Ciboulette” – an old forge built in the beginning of the 19th century. Fermeture du restaurant du mercredi 1 mai au mercredi 8 mai inclus. Ouverture avec une nouvelle carte le jeudi 9 mai. 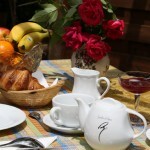 Welcome to “La Ciboulette” – restaurant and bed & breakfast in Foix ! If you are interested to book a room, you can do it using the calendar below. There is a discount if you would like to spend three or more consecutive nights at our place. For more information please call us directly on +33 (0)561011088.